19 weeks! Getting closer to goal! I'v enot been a very attentive blogger for the past couple of weeks, and I also hadn'tbeen tracking as well as I should. I have lots of reasons, but they don't matter! It's time to get back on this horse. So, for the first time in a while, here's a full blown weekly update! Here's some details to get us started. My weekly average has dipped below 4lbs a week to a respectable 3.8. I had an up and down week this week after posting a slight gain last week. I ended on a good note though, and feel like I'm back on track after Geekway. At my current rate I've got 5-7 weeks left on Medifast before I start transitioning. 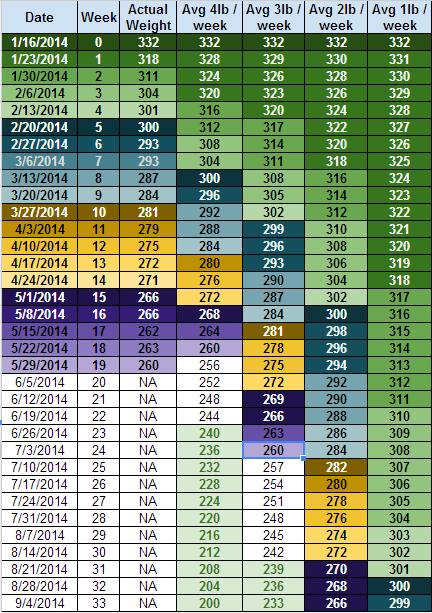 We've moved away from those big sweeping drops and settled in two knocking out 1 spot a week. That's to be expected now that I'm 'off the scale' for 1lb and 2lb losses. If I stick with a 3.x loss then I'll hit 240 5-7 weeks. That will put me in July, and then I'll transition. I think that's still feasible even with the slowdown I've seen recently. Looking at my TDEE, the past couple weeks have seen me eating more net calories. I need to make sure I'm getting in my exercise (I haven't been getting my extra in) and limiting some of my extra calories. I can exercise and eat more, or I can eat on plan and not exercise, but eating more and not exercising is a bad combination. My expected and actual weight for the week rejoined one another. 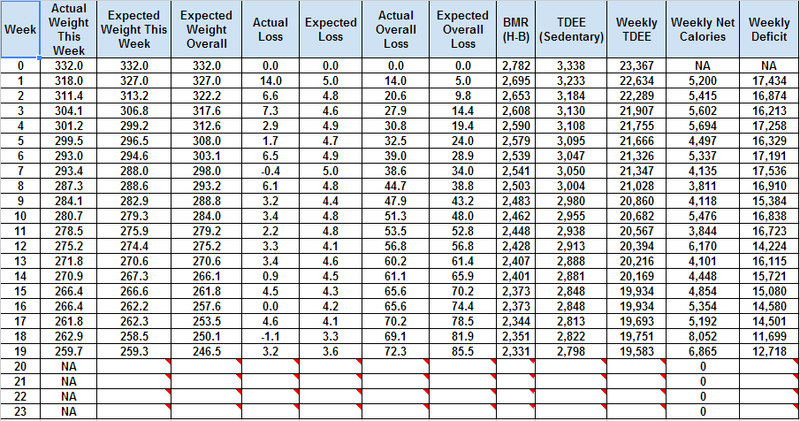 My expected loss by TDEE overall keeps dropping away from my actual, but I think that's clearly to be expected. I just need to track better and keep my hydration up and I think this will be more accurate. If nothing else I can track it over time and adjust my TDEE based on reality. So, there's my status update. I'm hovering just over my low weight right now. I just need to put in a few more weeks and then I can shift out of this mode! Then it's keep tracking, keep weighing, and making sure I maintain the loss. It's been a hectic week and I haven't had as much time to blog as I'd like. I'll try to get a full weekly update post up soon, but here's a quick one! Progress: I lost over 4 lbs the week before Geekway, but this week I ended up 1lb over last week. I know exactly why: working out last night, not drinking enough water at the convention, and not staying on plan. I had rice, potatoes, bread, etc while at Geekway, and all those carbs reloaded my glycogen stores, so it's back to the Medifast Plan at a fairly strict level for the next few days to get back on track. My weekly average has dropped to 3.8 lbs/week, which is still pretty awesome. I expect to have a big loss this week as well, if I'm right about holding onto glycogen. Since I don't have any scale victories this week, I'll add a couple non-scale: I had to add ANOTHER (this is #3) hole to my belt. It's really ridiculous at this point for me to still keep it, it's so long. Also, last night at workout class, I got about 75% of a pull-up done. This is the first time I've actually gotten most of the way there, and I think I'll be able to knock one out in a couple of weeks. Today is my wife and my 14th Anniversary, and in celebration I cooked a fancy dinner! Pork Tenderloin and Filet Mignon seared on an iron skillet and then finished in the oven with olive oil, salt, pepper, and garlic. Roasted mushrooms and asparagus with balsamic vinaigrette reduction. Seared green beans in sesame oil and soy sauce. And because it's a special occasion, dark chocolate dipped strawberries. While it's not 100% on plan, it's very close, and it's on a rare occasion! I just need to make sure to drink my water and really hit it at the gym tomorrow. From Wednesday-Sunday I was working the Geekway to the West board game convention, and never had a chance to blog. It was four days of hard work and tons of fun gaming! I did not really stay on plan for much of the weekend... I ate Medifast and tried to stay hydrated, but my meals included rice (with sushi), roasted potatoes, bacon and eggs, and even a sandwich during breakdown. That said, I was only up .3 lbs after the weekend, and I know that even with the extra carbs that I was eating at a calorie deficit, so while I may have gained some glycogen and water weight, I didn't gain any fat. I'll try to post a better post tomorrow, with more info and some pictures, but right now I'm still decompressing! 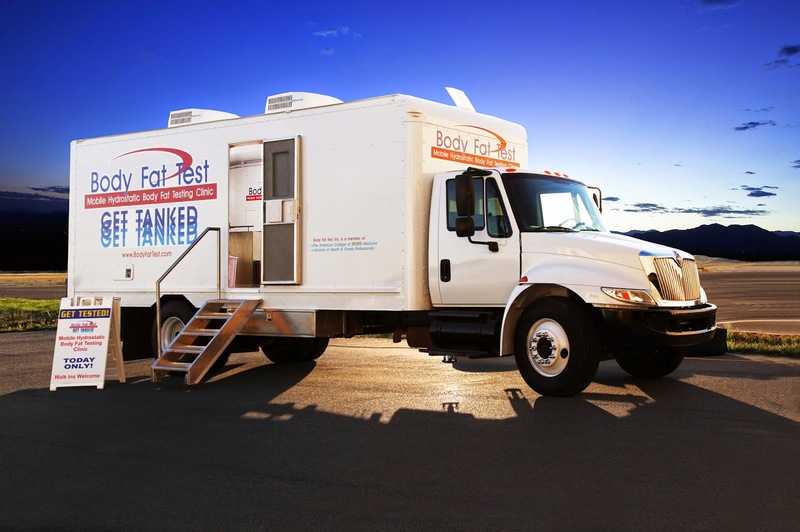 Hydrostatic Body Fat Test complete! Today at lunch I went to my gym to do a hydrostatic body fat assessment. It was an interesting experience! I showed up and was given a small room to change out of my work clothes into my swimsuit. While I was changing, Laura (the operator) asked me some basic questions... name, height, weight, why I was getting the test, etc. As I finished getting dressed she weighed me on a scale and then had me get into the tank. The water was warm, and she had me squeeze all the air bubbles out of my trunks, hook my toes under a bar, and put a dive belt across my lap. Then she gave the instructions, I was to lie back, pinch my nose closed, and breathe out, and she would tap the side of the tub when it was time to come up. My first time under, I was still breathing out when she tapped, and I came up.. that was just to make sure I was ok. The second time, I was still forcing air out when she let me up, told me to breathe out a little faster and go a little deeper, so my elbow wouldn't stick out of the water. The next time, I went deeper, got a good reading, and was told for the last time when I finished breathing out, to really clench my core and force the last air out. This last time I did that and stayed under for a half second and came up. While I got dressed, she put in the numbers and got me my report. I'm doing quite a bit better than expected! I still want to get to 240 lbs on Medifast, and then go into transition to lose the last bit. I was given some advice on nutrition, to increase my protein intake to 130 g/day every day, and to make sure to eat 25-30g after working out. I plan to go back for a followup test in a few months! This week is the 10th Annual Geekway to the West. It's a 4-day board gaming convention, and I am one of the board members/organizers. This convention takes up a TON of my time, as there is a ton to do and only a few people to do it, but we're coming in to the home stretch now. This weekend I finalized registrations and got the 801 people coming off to our graphic designer so he can get badges printed, put in an order for an extra 120 games for our free game giveaway, bought another few hundred dollars worth of games for door prizes, volunteer prizes, and to fill some spots in our library, and then went to our annual 'Punch and Play' event, where we get the games ready for Play and Win, and try to play a few of them too. Wednesday night is setup, where we organize the event space, vendor space, open play area, library, registration, and play and win areas, and also try to figure out where exactly we're going to put the 850 games we're giving away to people. What does all this mean though? Well, I'll probably be getting a lot more incidental walking and lifting than normal, but it also means I'm eating meals out for multiple nights in a row, with limited access to on-plan choices. It will be an interesting week. I'm going to do the best I can, but I don't expect to manage 100% plan compliance. Combining that with me skipping the gym this week because of the convention, and well, we'll see what happens. regardless, it will be fun! 16 Weeks. Zero loss this week, bleh. Between exercise, being sick, or whatever, this week was a static week for me. I ended up exactly where I was last Thursday, with my weight bouncing from a low of 264.5 (1.3 lbs down from previous low on April 27th), to a high of 267.4 (1 lb more than last week's final weigh-in, and 2.9 lbs over my low). Not sure who the culprit is, but I'm hopeful that this means I'll have an easier time losing next week. With 4 days of Geekway throwing a wrench into Lean and green, I'll need all the help I can get. Just realized that I hadn't blogged yet today... I've been super busy though, between a couple of work projects, Geekway coming in a week, grocery shopping, workout class, and more. I was up a ton today, all water weight I know, but it's still annoying. I hope it will all melt off tonight, as I've been drinking a ton of water. However, I'm also feeling a little sick, and I'm not sure how that will mess with me. I managed to make it through my workout class ok, but since then I've felt bleh. Here's to tomorrow giving me a nice surprise on the scale for when I post my weekly update! General Tuesday - Hogwarts! Hearthstone! Exercise! Geekway! I thought this would be a good time to catch up on a number of topics, just to touch on a variety of things. We've done introductions, initial weigh-in, an exercise challenge, and a trivia challenge. So far the entire challenge is running very well and I have to give huge props to the person running this, she's really stepped up and is making this a fun thing to do! My 'Goalbusters' Class is still going strong. We're up to do ing 2 sets of 70 squats at the start of class, and each station is up to one minute. Last night we did lots of partner work... waves on the rope while our partner anchored, isometric holds with resistance bands interlocked, and doing side lunges simultaneously with out partner, planking face to face with our partner and alternating claps, kettlebell squats handing off each time to our partner, and medicine ball bounces across the room from wall squats to each other. In addition to two circuits of that, we did biceps and triceps work, crunches, and stretching. The game convention (http://geekway2west.com) I help run is in full swing. I just loaded another 10 boxes of board games to give away into my car to take to the storage unit. I still need to pack all the games that I have for the game library, get the Play and Win games packed and ready to go to the Punch and Play Day at Jay's house, cheer on my wife as she folds and organizes another 100 convention T-shirts, and finish my board game for the Game Design competition while keeping up with last minute registrations. Fun times! 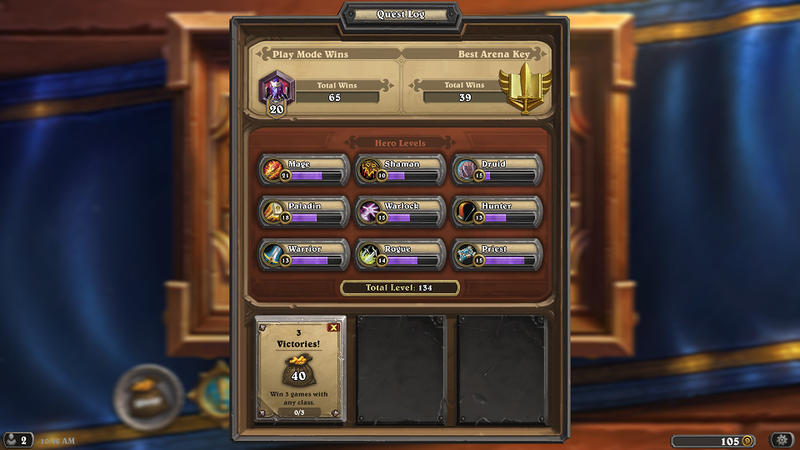 I finished up an arena run last night with a Mage deck I expected to go to 5+ wins and only got 2 wins. I lost TWO games to disconnects/crashes (stupid Windows 8 tablet) where I was crushing my opponent. Then I went from 0-2 to 2-2 playing exactly the way I expected the deck to work. My final game though, was against a Warlock. Despite over half my deck costing 0-3 crystals, my initial hand was Coin and 4 4+ cost spells. I threw everything back... and got 3 4+ cost spells and a single 3-cost spell (Arcane intellect). My opponent opened with a Flame Imp and it never got better. I didn't have a minion on the board until I was at 18 life, but I fought back and got them to 11 with enough damage on the board to kill them next turn, and two secrets in play, a Vaporize and an Ice Barrier. I had 5 life. If my opponent had just attacked, then between the Vaporize and the Ice Barrier, I'd have lived through the turn and swung in for the win. Instead he Hellfired and then Soulfired me, my Barrier never went off, and I died. Ah well. I did get a nice card out of my pack rewards, though. 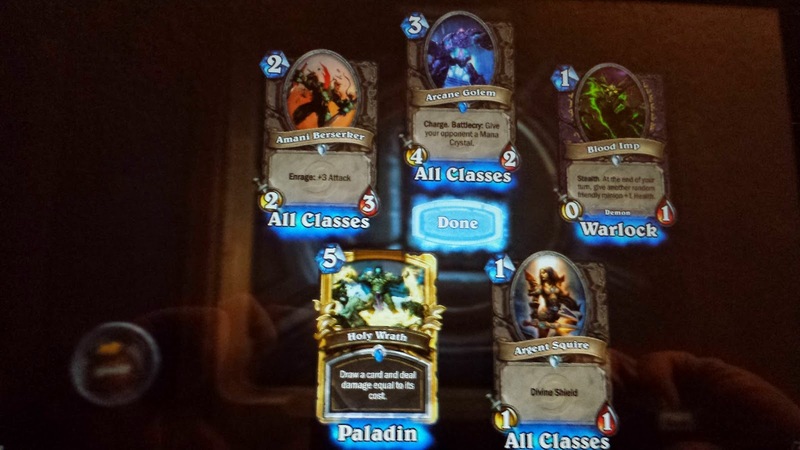 Oooh.. Golden Holy Wrath! Shiny! I just started a Hogwarts Challenge on MFP. 120 of us got sorted into the four houses (I'm Slytherin, obviously!) 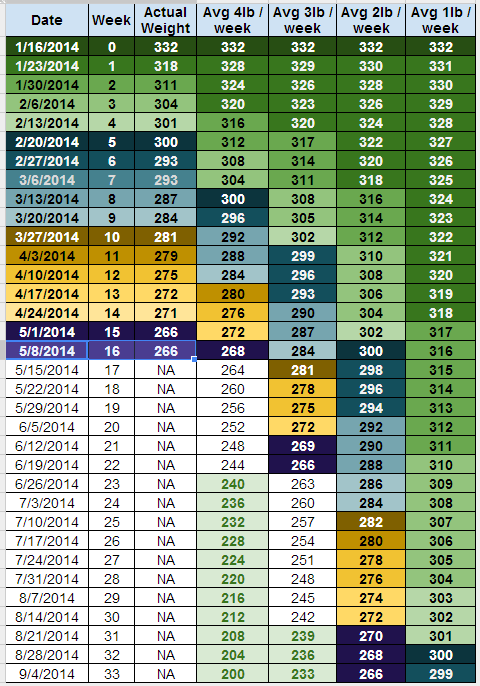 and will be tracking our weight for 10 weeks and doing food, exercise, and trivia challenges. Our first challenges have been basic: Introduce ourselves, give an initial weight, and our first exercise challenge, do 100 jumping jacks. 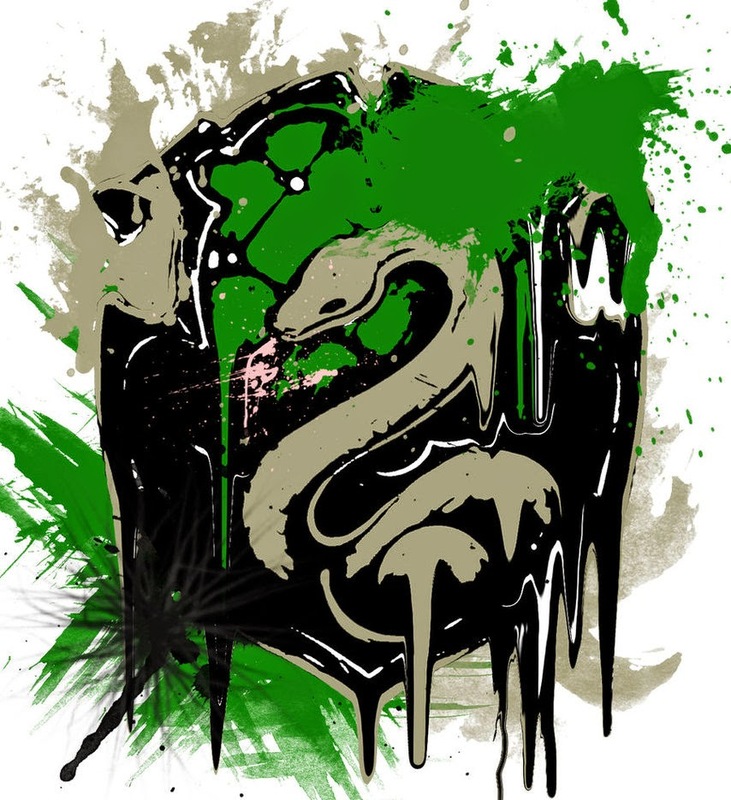 I'm looking forward to the challenge, and I'm sure Slytherin will destroy the competition and take home the House Cup! In other news, you may have noticed I failed to blog this weekend. It's getting easier to skip blogging on the weekends, and then catching up on Monday. This weekend I did a ton of yard work on Saturday: mowing, trimming, cleaning up branches. There's still a lot more to do. Sunday we had a board game afternoon, and ended up playing two games of Eminent Domain with the Escalation expansion... one with Scenarios, one without. Then we played Euphoria, the game I showed a picture of last week. We played two-player this time, and while it wasn't as good as 4-player, it played in 40 minutes, which was nice. We closed out with a quick game of Can't Stop and did some work on our Puzzle as well. Finally, I am still playing Hearthstone! Not as much as some of my friends, but I've gotten over the hump and and am making decent progress. I'm trying to get all nine heroes to at least level 15 right now, and I want to level them up together, as I think playing a Hero is the best way to learn how to beat it! Not great, but I'm getting better! Brief blog post... I tried the Chicken and Wild Rice Soup. Verdict? Not good. Like most of the hearty meals it really needs to soak. It had too many peas and was very bland. Adding chicken and hot sauce made it barely palatable. Not a fan but with the right seasoning it might be better. Next time I will use broth and add garlic to it. It is actually pretty surprising to me how well this has been going for the past 15 weeks. Am I sticking 100% to the 5 and 1 plan? No, no I am not. I'm eating a lot of extra lean protein over and above the recommended amount. Be it cans of tuna, a few extra ounces of chicken, a bag of turkey jerky, or some light cheese. I'm also adding more sauces and condiments than you're really supposed to. However, I know that if I was eating bland chicken every night, I'd not be here right now, so adding sauces and spices over the recommended amounts just makes sense. Yes it is increasing the sodium and making me lose weight slower... however, it is also letting me stick with this. 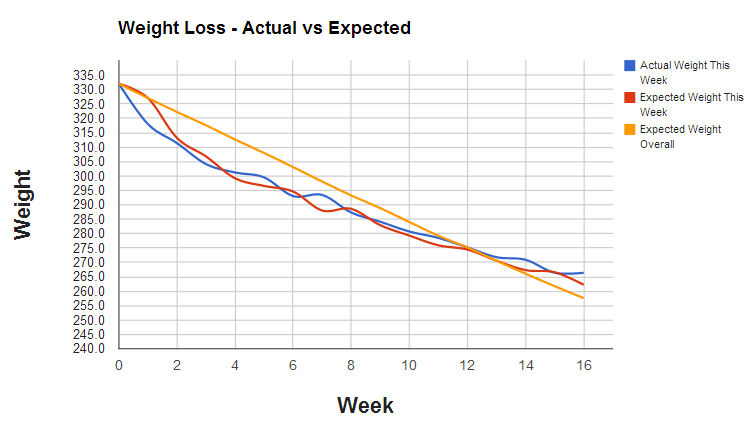 Last week was frustrating, with only a 1 lb loss. This week started out amazing, then took a U-turn, and finally ended up in a great spot. I try not to think too much about daily changes, but it's hard not to. 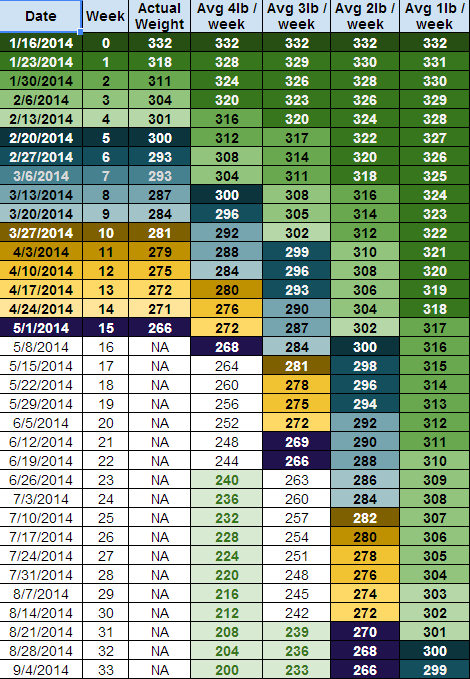 Another week is down, though, so let's look at some data! Click me to embiggen so you can actually read this! Three huge losses to start the week, then three gains, then another big loss. this is what happens when you don't manage your water and exercise, you hang on to all that water and don't let it go. I think I would have been down a couple more pounds if I'd wrangled my water better, but as you can see from week 14, I wasn't really focused on that. I'm making a point to keep drinking my water today and I'm going to see if I can have a steadier week for week 16. 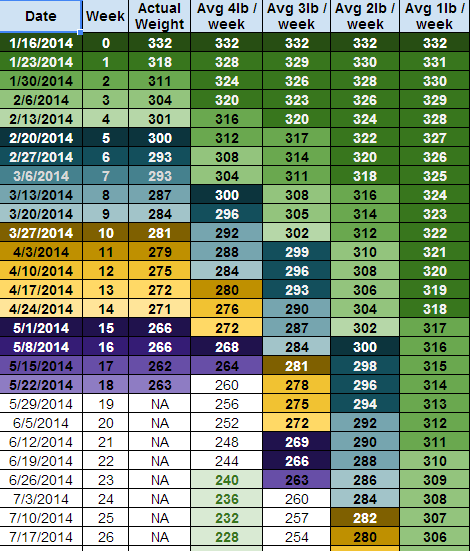 For my weekly progress chart, you get the full one this week. I'm staying a week ahead of the 4 pound a week average for now, but I'm steadily backsliding and I expect that in a couple weeks I'll be at a 4lb average. However, there's some exciting stuff going on here... I closed out the 2/lb column this week, chewing up three spots! Also, I'm 6-8 weeks from goal weight at 3-4 lbs a week. I think I can maintain 3+ a week, so that means I'll be very close to goal when we go on our cruise! On the TDEE front, I was just about where my spreadsheet says I should be. I'll take it. I'm sliding away from the 'expected overall' still, but I did better this week and that's good enough. I still think going by a Sedentary TDEE and then tracking calorie burn is a good system, but I also know that my calorie burn is based on voodoo and not any reality, since I'm doing a mix of cardio and strength and never wear an HRM. Finally, let's look at my graph. You can click me too! 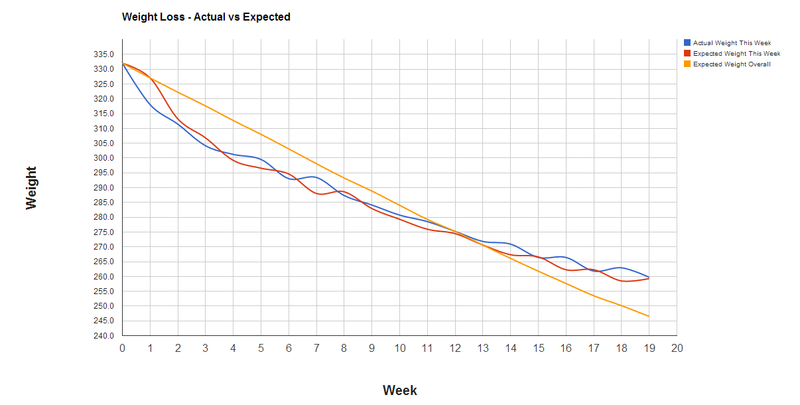 My actual weight dipped just below my expected weight for this week, while my expected overall continues on its steady drop. I hope to get those lines a little closer together next week, but chances are that I'm not going to overtake that line again. That's ok, being ahead of the game for the early part makes this journey a lot easier, and I'm a LOT closer to the bottom of the graph than the top.